This cozy, low-key café has quickly became a favorite destination for breakfast, brunch, lunch and dinner in spite of a slightly off the beaten path location and scaled down hours of service. Banana Bean’s menu is a funky fusion of Floribbean flavors combining the cuisines of Cuba, Jamaica, the Caribbean and Key West. Peachy terra cotta style walls, a Conch Republic flag and a live TV feed from the Hogs Breath Tavern, an infamous Key West fixture, fuse with other fun elements to establish an atmosphere that transports diners far south of Interstate 70. Different tastes blend together to create many memorable menu items. The Arnold Palmer is a mix of iced tea and lemonade, the perfect beverage for the undecided. 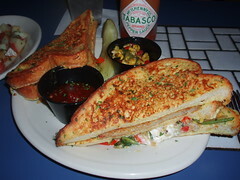 The #1 Little Havana Cubano is among the number one best sellers for lunch. This sandwich stacks citrus kissed pork tenderloin and sweet bolo ham with Emmenthaler Swiss cheese, dill pickle slices and Dijon in between two crunchy slices of Cuban bread. Since the majority of the menu is available all day, it is agonizing to decide among the eclectic choices but one “Bruncher” item is a must any time, even as a default desert. 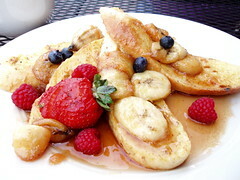 Bananas Foster French Toast features thick slices of Cuban style bread perfectly transformed into French Toast with fresh berries; Captain Morgan spiced rum sauce, bananas, and a dollop of whipped cream. 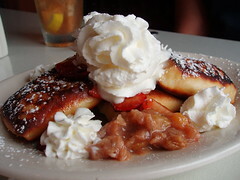 The crepes can be a meal or a dessert, or whatever – again the is the perfect place for the undecided – since many elements of the menu are interchangable. The hours and the size of the cafe can sometimes be a challenge – but it is worth the wait if there is one. The service is top notch and friendly. The Bean is a must visit and probably one of the best Columbus has to offer for casual cuisine. Funky Fact: The Patina of Key West?? Patina, that’s what the sign says, I looked up patina and googled it but could not get a precise answer, so I e-mailed the owners. You won’t get wasted away in Margaritaville here – there is no alcohol available on the menu. A version of this appears in C-Bus Magazine. This entry was posted on October 25, 2007 at 5:54 PM	and is filed under CLOSED, restaurant reviews, restaurants, Vegetarian Friendly. Tagged: Banana Bean Cafe. You can follow any responses to this entry through the RSS 2.0 feed. You can leave a response, or trackback from your own site. but you can do byob, no? either way, one of my favorite joints in columbus — and well worth the wait. I like the Banana Bean and once made a special trip there for fried sweet potatoes. (Are they still on the menu?) Unfortunately, I arrived too late for lunch and too early for dinner. So sad. I’m glad I had the opportunity to meet you this evening at COSI. Your blog is going to tempt me to dine out more often. 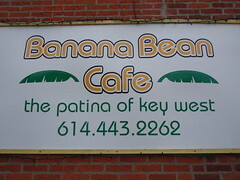 I have got to get back to Banana Bean and get my fix soon. DAMN it has been tooooo long!!! We will not be back. We went to the Greenlawn location for brunch today and were told we could not dine in without a reservation. The restaurant was only about 75% full and the entire bar seating was empty. We only had a party of 2, so it wan’t like I showed up without a reservation for a group of 8. I travel weekly to NYC and LA and have never been turned away from service. I will gladly put my name on a wait list or sit at the bar. I have never met a restaurant owner who will rudely turn away customers with such a matter of fact attitude. I find it quite humorous that I was in Malibu last week and walked right in a restaurant for lunch. I was in line behind Steven Tyler and had no problem getting a seat (and I am obviously not famous). But then I come home to Columbus and get treated like a 2nd rate citizen at a restaurant in a bad neighborhood with a view of an interstate and 40 softball fields. Classless and poor business.